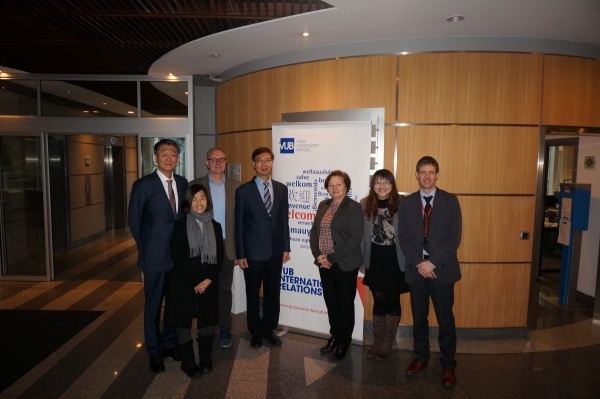 On 26 November 2018, the Chair Asia-Pacific Studies received a delegation from National Dong Hwa University (Taiwan), including Dr. Chin-peng Chu (Vice President), Dr. Yun-chen Lai (Director of International Affairs) and Ms. Li-chi Liu (Programme Manager of International Affairs). They were received by Prof. Dr. Jan Danckaert (Vice-rector Education and Student Affairs), Dr. Jacqueline Couder (Head International Relations), Mr. Gunther Gaublomme (Director of the Brussels Diplomatic Academy), Prof. Dr. Kim Van Der Borght (Chairholder of Asia-Pacific Studies), and Prof. Dr. Wan-li Wang (Director of Asia-Pacific Studies). There has been a commitment to join forces on research, including a PhD programme as well as the exchange of students and staff.